Do you love styling your baby in the hottest moccs available? If you do, I'm sure you've heard of Freshly Picked. 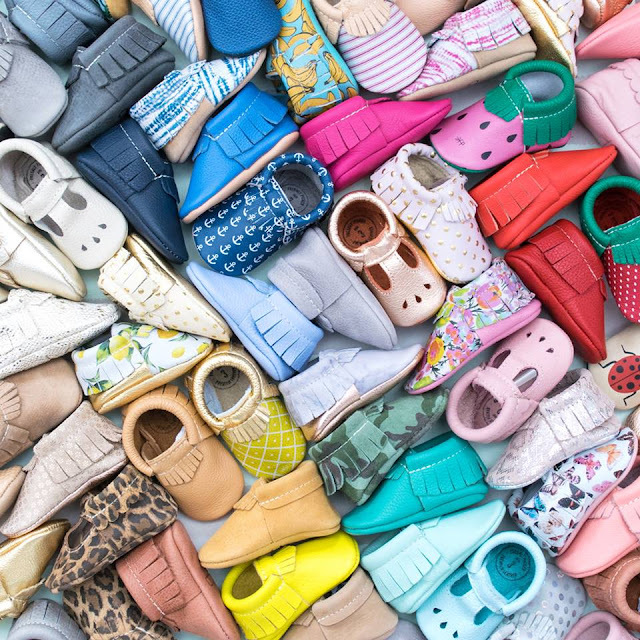 Freshly Picked has an incredible selection of gorgeous, trendy moccs that are comfy for babies to wear, and stay on their feet. Freshly Picked all began with Founder, Susan Petersen, creating moccs out of scrap leather at her kitchen table, back in 2009. Today, Freshly Picked has shipped their stylish moccs to the rich and famous, and to mocc-lovers all over the world. We're kicking off our Summer Style Guide by teaming up with our friends at Freshly Picked to offer our readers a chance to win a pair FP Moccs! 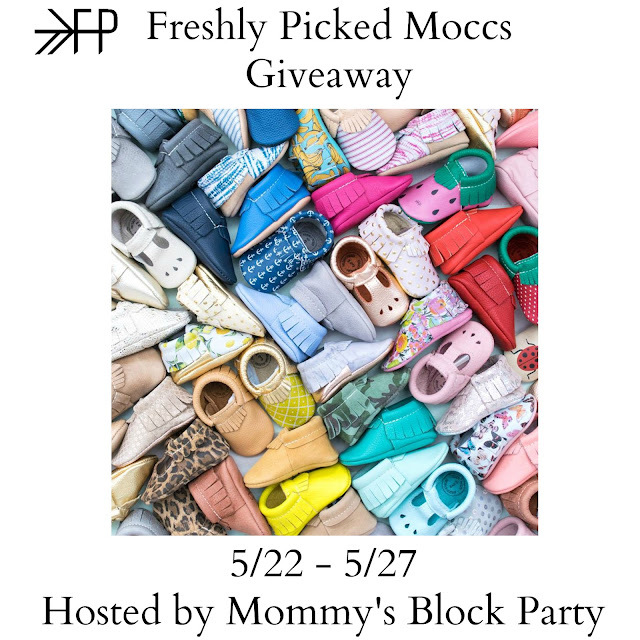 One lucky MBP reader will win a pair of Freshly Picked Moccs (winner's choice of style and color). Giveaway is open to US readers, 18+. Just use the hnady RC entry form below to enter for your chance to win. Mommy's Block Party is not responsible for prize fulfillment or shipment. Please see our policies page for details. I love Freshly Picked and the story of how they were created - a hard-working Mama following her dream. I love the Capri moccs because they remind me of a pair that I had when I was little. I like the flower power moccs! They are super cute. It is not terrible by any means, but it's also not like it could be. Moreover, there isn't any evidence to suggest he received a commission to conduct this mass elsewhere. You'll discover the way the creative power of thought impacts the material world. You take in many of portions of vegetables within a beverage and receive all the benefits of eating the vegetable. Granted, not all green juices are made equal, so you are going to want to research any that you're contemplating purchasing (HighYa is a huge place to begin!) Don't require thev food served on airplanes, since most of the time they aren't plant-based or wholesome alternatives. I'd choose the Ebony Mary-Janes. They're so cute! The Iced Lavender Mocs are adorable! I'd love a pair for my daughter. The very best diet program will be mediocre at optimal/optimally in the event you do not incorporate some normal physical training. One of the greatest strategies to slim down is by diet and exercise and the correct type of both. Fad diets make big promises. The watermelon mocs are the perfect pair for summertime. There are so many cute ones to choose from. Also love the Watermelon moccs! I love the citron moccs!! I think the city moccs are really cute! I like the flower power moccs! I like their city moccs the most! The neon coral are too cute for words! I'd love a pair for my munchkin. I'm digging the tickled pink ones! It has given us a network of info allowing us to find nearly every info that we might need together with communicate with people from throughout the world. Relative to the total population of internet users, the website's audience tends. According toInc., it is among the fastest growing business websites on the Internet. Researchers imply that the pancreas includes taste receptors that may identify sweet substances. Iron is the fundamental component that determines the health and quantity of amounts in blood. For a fit and healthier body, a mix of essential nutrients is critical. I would get the Linen Moccassins! The blush maryjanes are adorable. Love the color! It'd match with a lot of my daughter's outfits. I would love the Ebony Next Step. I would also love the Tan Sandals! Thanks for a great giveaway! I would love the gold moccs! I watched the shark tank episode when Susan was on there :) What a great story she has. The heirloom or ebony are my favorite ones. Thank you! Love the let it go as well! I would love flower power!!! SOOOOO Cute!!!! Although, there are a few challenges involved with online marketing, it can be safely said that online marketing has led to greater transparency and simplicity of purchasing products. There isn't any other marketing and advertising strategy that has this kind of on demand capability. It aids the advertising team get better comprehension of the requirements and reach.